This article is about the revolutions of 1917. For the revolution of 1905, see 1905 Russian Revolution. Russian society, bolsheviks, mensheviks, SRs, etc. The Russian Revolution was a pair of revolutions in Russia in 1917 which dismantled the Tsarist autocracy and led to the rise of the Soviet Union. The Russian Empire collapsed with the abdication of Emperor Nicholas II and the old regime was replaced by a provisional government during the first revolution of February 1917 (March in the Gregorian calendar; the older Julian calendar was in use in Russia at the time). Alongside it arose grassroots community assemblies (called 'Soviets') which contended for authority. In the second revolution that October, the Provisional Government was toppled and all power was given to the Soviets. The February Revolution (March 1917) was a revolution focused around Petrograd (now Saint Petersburg), the capital of Russia at that time. In the chaos, members of the Imperial parliament (the Duma) assumed control of the country, forming the Russian Provisional Government which was heavily dominated by the interests of large capitalists and the noble aristocracy. The army leadership felt they did not have the means to suppress the revolution, resulting in Tsar Nicholas's abdication. The Soviets, which were dominated by soldiers and the urban industrial working class, initially permitted the Provisional Government to rule, but insisted on a prerogative to influence the government and control various militias. The February Revolution took place in the context of heavy military setbacks during the First World War (1914–18), which left much of the Russian Army in a state of mutiny. A period of dual power ensued, during which the Provisional Government held state power while the national network of Soviets, led by socialists, had the allegiance of the lower classes and, increasingly, the left-leaning urban middle class. During this chaotic period there were frequent mutinies, protests and many strikes. Many socialist political organizations were engaged in daily struggle and vied for influence within the Duma and the Soviets, central among which were the Bolsheviks ("Ones of the Majority") led by Vladimir Lenin who campaigned for an immediate end to the war, land to the peasants, and bread to the workers. When the Provisional Government chose to continue fighting the war with Germany, the Bolsheviks and other socialist factions were able to exploit virtually universal disdain towards the war effort as justification to advance the revolution further. The Bolsheviks turned workers' militias under their control into the Red Guards (later the Red Army) over which they exerted substantial control. In the October Revolution (November in the Gregorian calendar), the Bolsheviks led an armed insurrection by workers and soldiers in Petrograd that successfully overthrew the Provisional Government, transferring all its authority to the Soviets with the capital being relocated to Moscow shortly thereafter. The Bolsheviks had secured a strong base of support within the Soviets and, as the now supreme governing party, established a federal government dedicated to reorganizing the former empire into the world's first socialist republic, practicing Soviet democracy on a national and international scale. The promise to end Russia's participation in the First World War was honored promptly with the Bolshevik leaders signing the Treaty of Brest-Litovsk with Germany in March 1918. To further secure the new state, the Cheka was established which functioned as a revolutionary security service that sought to weed out and punish those considered to be "enemies of the people" in campaigns consciously modeled on similar events during the French Revolution. Soon after, civil war erupted among the "Reds" (Bolsheviks), the "Whites" (counter-revolutionaries), the independence movements and the non-Bolshevik socialists. It continued for several years, during which the Bolsheviks defeated both the Whites and all rival socialists and thereafter reconstituted themselves as the Communist Party. In this way, the Revolution paved the way for the creation of the Union of Soviet Socialist Republics (USSR) in 1922. While many notable historical events occurred in Moscow and Petrograd, there was also a visible movement in cities throughout the state, among national minorities throughout the empire and in the rural areas, where peasants took over and redistributed land. The Russian Revolution of 1905 was said to be a major factor contributing to the cause of the Revolutions of 1917. The events of Bloody Sunday triggered nationwide protests and soldier mutinies. A council of workers called the St. Petersburg Soviet was created in this chaos. While the 1905 Revolution was ultimately crushed, and the leaders of the St. Petersburg Soviet were arrested, this laid the groundwork for the later Petrograd Soviet and other revolutionary movements during the lead up to 1917. The 1905 Revolution also led to the creation of a Duma (parliament), that would later form the Provisional Government following February 1917. The outbreak of World War I prompted general outcry directed at Tsar Nicholas II and the Romanov family. While the nation was initially engaged in a wave of nationalism, increasing numbers of defeats and poor conditions soon flipped the nation's opinion. The Tsar attempted to remedy the situation by taking personal control of the army in 1915. This proved to be extremely disadvantageous for the Tsar, as he was now held personally responsible for Russia's continuing defeats and losses. In addition, Tsarina Alexandra, left to rule in while the Tsar commanded at the front, was German born, leading to suspicion of collusion, only to be exacerbated by rumors relating to her relationship with the controversial mystic Grigori Rasputin. Rasputin's influence led to disastrous ministerial appointments and corruption, resulting in a worsening of conditions within Russia. This led to general dissatisfaction with the Romanov family, and was a major factor contributing to the retaliation of the Russian Communists against the royal family. After the entry of the Ottoman Empire on the side of the Central Powers in October 1914, Russia was deprived of a major trade route through the Dardanelles, which further contributed to the economic crisis, in which Russia became incapable of providing munitions to their army in the years leading to 1917. However, the problems were primarily administrative, not industrial, as Germany was able to produce great amounts of munitions whilst constantly fighting on two major battlefronts. The conditions during the war resulted in a devastating loss of morale within the Russian army and the general population of Russia itself. This was particularly apparent in the cities, owing to a lack of food in response to the disruption of agriculture. Food scarcity had become a considerable problem in Russia, but the cause of this did not lie in any failure of the harvests, which had not been significantly altered during wartime. The indirect reason was that the government, in order to finance the war, printed millions of ruble notes, and by 1917, inflation had made prices increase up to four times what they had been in 1914. Farmers were consequently faced with a higher cost of living, but with little increase in income. As a result, they tended to hoard their grain and to revert to subsistence farming. Thus the cities were constantly short of food. At the same time, rising prices led to demands for higher wages in the factories, and in January and February 1916, revolutionary propaganda, in part aided by German funds, led to widespread strikes. This resulted in a growing criticism of the government, including an increased participation of workers in revolutionary parties. Liberal parties too had an increased platform to voice their complaints, as the initial fervor of the war resulted in the Tsarist government creating a variety of political organizations. In July 1915, a Central War Industries Committee was established under the chairmanship of a prominent Octobrist, Alexander Guchkov (1862–1936), including ten workers' representatives. The Petrograd Mensheviks agreed to join despite the objections of their leaders abroad. All this activity gave renewed encouragement to political ambitions, and in September 1915, a combination of Octobrists and Kadets in the Duma demanded the forming of a responsible government. which the Tsar rejected. All these factors had given rise to a sharp loss of confidence in the regime, even within the ruling class, growing throughout the war. Early in 1916, Guchkov discussed with senior army officers and members of the Central War Industries Committee about a possible coup to force the abdication of the Tsar. In December, a small group of nobles assassinated Rasputin, and in January 1917 the Tsar's uncle, Grand Duke Nicholas, was asked indirectly by Prince Lvov whether he would be prepared to take over the throne from his nephew, Tsar Nicholas II. None of these incidents were in themselves the immediate cause of the February Revolution, but they do help to explain why the monarchy survived only a few days after it had broken out. Meanwhile, Socialist Revolutionary leaders in exile, many of them living in Switzerland, had been the glum spectators of the collapse of international socialist solidarity. French and German Social Democrats had voted in favour of their respective governments' war efforts. Georgi Plekhanov in Paris had adopted a violently anti-German stand, while Alexander Parvus supported the German war effort as the best means of ensuring a revolution in Russia. The Mensheviks largely maintained that Russia had the right to defend herself against Germany, although Julius Martov (a prominent Menshevik), now on the left of his group, demanded an end to the war and a settlement on the basis of national self-determination, with no annexations or indemnities. It was these views of Martov that predominated in a manifesto drawn up by Leon Trotsky (at the time a Menshevik) at a conference in Zimmerwald, attended by 35 Socialist leaders in September 1915. Inevitably Vladimir Lenin, supported by Zinoviev and Radek, strongly contested them. Their attitudes became known as the Zimmerwald Left. Lenin rejected both the defence of Russia and the cry for peace. Since the autumn of 1914, he had insisted that "from the standpoint of the working class and of the labouring masses the lesser evil would be the defeat of the Tsarist Monarchy"; the war must be turned into a civil war of the proletarian soldiers against their own governments, and if a proletarian victory should emerge from this in Russia, then their duty would be to wage a revolutionary war for the liberation of the masses throughout Europe. The social causes of the Russian Revolution can be derived from centuries of oppression of the lower classes by the Tsarist regime and Nicholas's failures in World War I. While rural agrarian peasants had been emancipated from serfdom in 1861, they still resented paying redemption payments to the state, and demanded communal tender of the land they worked. The problem was further compounded by the failure of Sergei Witte's land reforms of the early 20th century. Increasing peasant disturbances and sometimes actual revolts occurred, with the goal of securing ownership of the land they worked. Russia consisted mainly of poor farming peasants and substantial inequality of land ownership, with 1.5% of the population owning 25% of the land. The rapid industrialization of Russia also resulted in urban overcrowding and poor conditions for urban industrial workers (as mentioned above). Between 1890 and 1910, the population of the capital, Saint Petersburg, swelled from 1,033,600 to 1,905,600, with Moscow experiencing similar growth. This created a new 'proletariat' which, due to being crowded together in the cities, was much more likely to protest and go on strike than the peasantry had been in previous times. In one 1904 survey, it was found that an average of 16 people shared each apartment in Saint Petersburg, with six people per room. There was also no running water, and piles of human waste were a threat to the health of the workers. The poor conditions only aggravated the situation, with the number of strikes and incidents of public disorder rapidly increasing in the years shortly before World War I. Because of late industrialization, Russia's workers were highly concentrated. By 1914, 40% of Russian workers were employed in factories of 1,000+ workers (32% in 1901). 42% worked in 100–1,000 worker enterprises, 18% in 1–100 worker businesses (in the US, 1914, the figures were 18, 47 and 35 respectively). World War I added to the chaos. Conscription across Russia resulted in unwilling citizens being sent off to war. The vast demand for factory production of war supplies and workers resulted in many more labor riots and strikes. Conscription stripped skilled workers from the cities, who had to be replaced with unskilled peasants. When famine began to hit due to the poor railway system, workers abandoned the cities in droves seeking food. Finally, the soldiers themselves, who suffered from a lack of equipment and protection from the elements, began to turn against the Tsar. This was mainly because, as the war progressed, many of the officers who were loyal to the Tsar were killed, being replaced by discontented conscripts from the major cities who had little loyalty to the Tsar. Despite constant oppression, the desire of the people for democratic participation in government decisions was strong. Since the Age of Enlightenment, Russian intellectuals had promoted Enlightenment ideals such as the dignity of the individual and the rectitude of democratic representation. These ideals were championed most vociferously by Russia's liberals, although populists, Marxists, and anarchists also claimed to support democratic reforms. A growing opposition movement had begun to challenge the Romanov monarchy openly well before the turmoil of World War I. Dissatisfaction with Russian autocracy culminated in the huge national upheaval that followed the Bloody Sunday massacre of January 1905, in which hundreds of unarmed protesters were shot by the Tsar's troops. Workers responded to the massacre with a crippling general strike, forcing Nicholas to put forth the October Manifesto, which established a democratically elected parliament (the State Duma). Although the Tsar accepted the 1906 Fundamental State Laws one year later, he subsequently dismissed the first two Dumas when they proved uncooperative. Unfulfilled hopes of democracy fueled revolutionary ideas and violent outbursts targeted at the monarchy. One of the Tsar's principal rationales for risking war in 1914 was his desire to restore the prestige that Russia had lost amid the debacles of the Russo-Japanese War. Nicholas also sought to foster a greater sense of national unity with a war against a common and old enemy. The Russian Empire was an agglomeration of diverse ethnicities that had demonstrated significant signs of disunity in the years before the First World War. Nicholas believed in part that the shared peril and tribulation of a foreign war would mitigate the social unrest over the persistent issues of poverty, inequality, and inhumane working conditions. Instead of restoring Russia's political and military standing, World War I led to the slaughter of Russian troops and military defeats that undermined both the monarchy and Russian society to the point of collapse. The outbreak of war in August 1914 initially served to quiet the prevalent social and political protests, focusing hostilities against a common external enemy, but this patriotic unity did not last long. As the war dragged on inconclusively, war-weariness gradually took its toll. Although many ordinary Russians joined anti-German demonstrations in the first few weeks of the war, hostility toward the Kaiser and the desire to defend their land and their lives did not necessarily translate into enthusiasm for the Tsar or the government. Russia's first major battle of the war was a disaster; in the 1914 Battle of Tannenberg, over 30,000 Russian troops were killed or wounded and 90,000 captured, while Germany suffered just 12,000 casualties. However, Austro-Hungarian forces allied to Germany were driven back deep into the Galicia region by the end of the year. In the autumn of 1915, Nicholas had taken direct command of the army, personally overseeing Russia's main theatre of war and leaving his ambitious but incapable wife Alexandra in charge of the government. Reports of corruption and incompetence in the Imperial government began to emerge, and the growing influence of Grigori Rasputin in the Imperial family was widely resented. In 1915, things took a critical turn for the worse when Germany shifted its focus of attack to the Eastern front. The superior German army – better led, better trained, and better supplied – was quite effective against the ill-equipped Russian forces, driving the Russians out of Galicia, as well as Russian Poland during the Gorlice–Tarnów Offensive campaign. By the end of October 1916, Russia had lost between 1,600,000 and 1,800,000 soldiers, with an additional 2,000,000 prisoners of war and 1,000,000 missing, all making up a total of nearly 5,000,000 men. These staggering losses played a definite role in the mutinies and revolts that began to occur. In 1916, reports of fraternizing with the enemy began to circulate. Soldiers went hungry, lacked shoes, munitions, and even weapons. Rampant discontent lowered morale, which was further undermined by a series of military defeats. Casualty rates were the most vivid sign of this disaster. By the end of 1914, only five months into the war, around 390,000 Russian men had lost their lives and nearly 1,000,000 were injured. Far sooner than expected, inadequately trained recruits were called for active duty, a process repeated throughout the war as staggering losses continued to mount. The officer class also saw remarkable changes, especially within the lower echelons, which were quickly filled with soldiers rising up through the ranks. These men, usually of peasant or working-class backgrounds, were to play a large role in the politicization of the troops in 1917. The army quickly ran short of rifles and ammunition (as well as uniforms and food), and by mid-1915, men were being sent to the front bearing no arms. It was hoped that they could equip themselves with arms recovered from fallen soldiers, of both sides, on the battlefields. The soldiers did not feel as if they were valuable, rather they felt as if they were expendable. By the spring of 1915, the army was in steady retreat, which was not always orderly; desertion, plundering, and chaotic flight were not uncommon. By 1916, however, the situation had improved in many respects. Russian troops stopped retreating, and there were even some modest successes in the offensives that were staged that year, albeit at great loss of life. Also, the problem of shortages was largely solved by a major effort to increase domestic production. Nevertheless, by the end of 1916, morale among soldiers was even worse than it had been during the great retreat of 1915. The fortunes of war may have improved, but the fact of war remained which continually took Russian lives. The crisis in morale (as was argued by Allan Wildman, a leading historian of the Russian army in war and revolution) "was rooted fundamentally in the feeling of utter despair that the slaughter would ever end and that anything resembling victory could be achieved." The war did not only devastate soldiers. By the end of 1915, there were manifold signs that the economy was breaking down under the heightened strain of wartime demand. The main problems were food shortages and rising prices. Inflation dragged incomes down at an alarmingly rapid rate, and shortages made it difficult for an individual to sustain oneself. These shortages were a problem especially in the capital, St. Petersburg, where distance from supplies and poor transportation networks made matters particularly worse. Shops closed early or entirely for lack of bread, sugar, meat, and other provisions, and lines lengthened massively for what remained. Conditions became increasingly difficult to afford food and physically obtain it. Strikes increased steadily from the middle of 1915, and so did crime, but, for the most part, people suffered and endured, scouring the city for food. Working class women in St. Petersburg reportedly spent about forty hours a week in food lines, begging, turning to prostitution or crime, tearing down wooden fences to keep stoves heated for warmth, and continued to resent the rich. Government officials responsible for public order worried about how long people's patience would last. A report by the St. Petersburg branch of the security police, the Okhrana, in October 1916, warned bluntly of "the possibility in the near future of riots by the lower classes of the empire enraged by the burdens of daily existence." Tsar Nicholas was blamed for all of these crises, and what little support he had left began to crumble. As discontent grew, the State Duma issued a warning to Nicholas in November 1916, stating that, inevitably, a terrible disaster would grip the country unless a constitutional form of government was put in place. Nicholas ignored these warnings and Russia's Tsarist regime collapsed a few months later during the February Revolution of 1917. One year later, the Tsar and his entire family were executed. At the beginning of February, Petrograd workers began several strikes and demonstrations. On 7 March [O.S. 22 February], workers at Putilov, Petrograd's largest industrial plant, announced a strike. The next day, a series of meetings and rallies were held for International Women's Day, which gradually turned into economic and political gatherings. Demonstrations were organised to demand bread, and these were supported by the industrial working force who considered them a reason for continuing the strikes. The women workers marched to nearby factories bringing out over 50,000 workers on strike. By 10 March [O.S. 25 February], virtually every industrial enterprise in Petrograd had been shut down, together with many commercial and service enterprises. Students, white-collar workers, and teachers joined the workers in the streets and at public meetings. To quell the riots, the Tsar looked to the army. At least 180,000 troops were available in the capital, but most were either untrained or injured. Historian Ian Beckett suggests around 12,000 could be regarded as reliable, but even these proved reluctant to move in on the crowd, since it included so many women. It was for this reason that on 11 March [O.S. 26 February], when the Tsar ordered the army to suppress the rioting by force, troops began to revolt. Although few actively joined the rioting, many officers were either shot or went into hiding; the ability of the garrison to hold back the protests was all but nullified, symbols of the Tsarist regime were rapidly torn down around the city, and governmental authority in the capital collapsed – not helped by the fact that Nicholas had prorogued the Duma that morning, leaving it with no legal authority to act. The response of the Duma, urged on by the liberal bloc, was to establish a Temporary Committee to restore law and order; meanwhile, the socialist parties established the Petrograd Soviet to represent workers and soldiers. The remaining loyal units switched allegiance the next day. The Tsar directed the royal train back towards Petrograd, which was stopped on 14 March [O.S. 1 March], by a group of revolutionaries at Malaya Vishera. When the Tsar finally arrived at in Pskov, the Army Chief Nikolai Ruzsky, and the Duma deputies Alexander Guchkov and Vasily Shulgin suggested in unison that he abdicate the throne. He did so on 15 March [O.S. 2 March], on behalf of himself, and then, having taken advice on behalf of his son, the Tsarevich. Nicholas nominated his brother, the Grand Duke Michael Alexandrovich, to succeed him. But the Grand Duke realised that he would have little support as ruler, so he declined the crown on 16 March [O.S. 3 March], stating that he would take it only if that was the consensus of democratic action. Six days later, Nicholas, no longer Tsar and addressed with contempt by the sentries as "Nicholas Romanov", was reunited with his family at the Alexander Palace at Tsarskoye Selo. He was placed under house arrest with his family by the Provisional Government. The immediate effect of the February Revolution was a widespread atmosphere of elation and excitement in Petrograd. On 16 March [O.S. 3 March], a provisional government was announced. The center-left was well represented, and the government was initially chaired by a liberal aristocrat, Prince Georgy Yevgenievich Lvov, a member of the Constitutional Democratic Party (KD). The socialists had formed their rival body, the Petrograd Soviet (or workers' council) four days earlier. The Petrograd Soviet and the Provisional Government competed for power over Russia. The effective power of the Provisional Government was challenged by the authority of an institution that claimed to represent the will of workers and soldiers and could, in fact, mobilize and control these groups during the early months of the revolution – the Petrograd Soviet Council of Workers' Deputies. The model for the Soviets were workers' councils that had been established in scores of Russian cities during the 1905 Revolution. In February 1917, striking workers elected deputies to represent them and socialist activists began organizing a citywide council to unite these deputies with representatives of the socialist parties. On 27 February, socialist Duma deputies, mainly Mensheviks and Socialist Revolutionaries, took the lead in organizing a citywide council. The Petrograd Soviet met in the Tauride Palace, the same building where the new government was taking shape. The leaders of the Petrograd Soviet believed that they represented particular classes of the population, not the whole nation. They also believed Russia was not ready for socialism. They viewed their role as limited to pressuring hesitant "bourgeoisie" to rule and to introduce extensive democratic reforms in Russia (the replacement of the monarchy by a republic, guaranteed civil rights, a democratic police and army, abolition of religious and ethnic discrimination, preparation of elections to a constituent assembly, and so on). They met in the same building as the emerging Provisional Government not to compete with the Duma Committee for state power, but to best exert pressure on the new government, to act, in other words, as a popular democratic lobby. The relationship between these two major powers was complex from the beginning and would shape the politics of 1917. The representatives of the Provisional Government agreed to "take into account the opinions of the Soviet of Workers' Deputies", though they were also determined to prevent "interference in the actions of the government", which would create "an unacceptable situation of dual power." In fact, this was precisely what was being created, though this "dual power" (dvoevlastie) was the result less of the actions or attitudes of the leaders of these two institutions than of actions outside their control, especially the ongoing social movement taking place on the streets of Russia's cities, factories, shops, barracks, villages, and in the trenches. The 2nd Moscow Women Death Battalion protecting the Winter Palace as the last guards of the stronghold. Other political groups were trying to undermine him. Heavy military losses were being suffered on the front. There was enormous discontent with Russia's involvement in the war, and many were calling for an end to it. There were great shortages of food and supplies, which was difficult to remedy because of the wartime economic conditions. The political group that proved most troublesome for Kerensky, and would eventually overthrow him, was the Bolshevik Party, led by Vladimir Lenin. Lenin had been living in exile in neutral Switzerland and, due to democratization of politics after the February Revolution, which legalized formerly banned political parties, he perceived the opportunity for his Marxist revolution. Although return to Russia had become a possibility, the war made it logistically difficult. Eventually, German officials arranged for Lenin to pass through their territory, hoping that his activities would weaken Russia or even – if the Bolsheviks came to power – led to Russia's withdrawal from the war. Lenin and his associates, however, had to agree to travel to Russia in a sealed train: Germany would not take the chance that he would foment revolution in Germany. After passing through the front, he arrived in Petrograd in April 1917. On the way to Russia, Lenin prepared the April Theses, which outlined central Bolshevik policies. These included that the Soviets take power (as seen in the slogan "all power to the Soviets") and denouncing the liberals and social revolutionaries in the Provisional Government, forbidding co-operation with it. Many Bolsheviks, however, had supported the Provisional Government, including Lev Kamenev. Soviets attacking the tsarist police in the early days of the March Revolution. With Lenin's arrival, the popularity of the Bolsheviks increased steadily. Over the course of the spring, public dissatisfaction with the Provisional Government and the war, in particular among workers, soldiers and peasants, pushed these groups to radical parties. Despite growing support for the Bolsheviks, buoyed by maxims that called most famously for "all power to the Soviets," the party held very little real power in the moderate-dominated Petrograd Soviet. In fact, historians such as Sheila Fitzpatrick have asserted that Lenin's exhortations for the Soviet Council to take power were intended to arouse indignation both with the Provisional Government, whose policies were viewed as conservative, and the Soviets themselves, which were viewed as subservients to the conservative government. By some other historians' accounts, Lenin and his followers were unprepared for how their groundswell of support, especially among influential worker and soldier groups, would translate into real power in the summer of 1917. On 18 June, the Provisional Government launched an attack against Germany that failed miserably. Soon after, the government ordered soldiers to go to the front, reneging on a promise. The soldiers refused to follow the new orders. The arrival of radical Kronstadt sailors – who had tried and executed many officers, including one admiral – further fueled the growing revolutionary atmosphere. Sailors and soldiers, along with Petrograd workers, took to the streets in violent protest, calling for "all power to the Soviets." The revolt, however, was disowned by Lenin and the Bolshevik leaders and dissipated within a few days. In the aftermath, Lenin fled to Finland under threat of arrest while Trotsky, among other prominent Bolsheviks, was arrested. The July Days confirmed the popularity of the anti-war, radical Bolsheviks, but their unpreparedness at the moment of revolt was an embarrassing gaffe that lost them support among their main constituent groups: soldiers and workers. The Bolshevik failure in the July Days proved temporary. The Bolsheviks had undergone a spectacular growth in membership. Whereas, in February 1917, the Bolsheviks were limited to only 24,000 members, by September 1917 there were 200,000 members of the Bolshevik faction. Previously, the Bolsheviks had been in the minority in the two leading cities of Russia—St. Petersburg and Moscow behind the Mensheviks and the Socialist Revolutionaries, by September the Bolsheviks were in the majority in both cities. Furthermore, the Bolshevik-controlled Moscow Regional Bureau of the Party also controlled the Party organizations of the 13 provinces around Moscow. These 13 provinces held 37% of Russia's population and 20% of the membership of the Bolshevik faction. In August, poor and misleading communication led General Lavr Kornilov, the recently appointed Supreme Commander of Russian military forces, to believe that the Petrograd government had already been captured by radicals, or was in serious danger thereof. [dubious – discuss] In response, he ordered troops to Petrograd to pacify the city. To secure his position, Kerensky had to ask for Bolshevik assistance. He also sought help from the Petrograd Soviet, which called upon armed Red Guards to "defend the revolution." The Kornilov Affair failed largely due to the efforts of the Bolsheviks, whose influence over railroad and telegraph workers proved vital in stopping the movement of troops. With his coup failing, Kornilov surrendered and was relieved of his position. The Bolsheviks' role in stopping the attempted coup further strengthened their position. In early September, the Petrograd Soviet freed all jailed Bolsheviks and Trotsky became chairman of the Petrograd Soviet. Growing numbers of socialists and lower-class Russians viewed the government less as a force in support of their needs and interests. The Bolsheviks benefited as the only major organized opposition party that had refused to compromise with the Provisional Government, and they benefited from growing frustration and even disgust with other parties, such as the Mensheviks and Socialist Revolutionaries, who stubbornly refused to break with the idea of national unity across all classes. In Finland, Lenin had worked on his book State and Revolution and continued to lead his party, writing newspaper articles and policy decrees. By October, he returned to Petrograd (present-day St. Petersburg), aware that the increasingly radical city presented him no legal danger and a second opportunity for revolution. Recognising the strength of the Bolsheviks, Lenin began pressing for the immediate overthrow of the Kerensky government by the Bolsheviks. Lenin was of the opinion that taking power should occur in both St. Petersburg and Moscow simultaneously, parenthetically stating that it made no difference which city rose up first, but expressing his opinion that Moscow may well rise up first. The Bolshevik Central Committee drafted a resolution, calling for the dissolution of the Provisional Government in favor of the Petrograd Soviet. The resolution was passed 10–2 (Lev Kamenev and Grigory Zinoviev prominently dissenting) promoting the October Revolution. The October Revolution, night to Wednesday 7 November 1917 according to the modern Gregorian calendar and night to Wednesday 25 October according to the Julian calendar at the time in tsarist Russia, was organized by the Bolshevik party. Lenin did not have any direct role in the revolution and due to his personal security he was hiding. The Revolutionary Military Committee established by the Bolshevik party was organizing the insurrection and Leon Trotsky was the chairman. However, Lenin played a crucial role in the debate in the leadership of the Bolshevik party for a revolutionary insurrection as the party in the autumn of 1917 received a majority in the soviets. An ally in the left fraction of the Revolutionary-Socialist party, SR, with huge support among the peasants who opposed Russia's participation in the war, supported the slogan 'All power to the Soviets'. Of more interests is the anarchist movement of Nestor Makhno in Ukraine who fought against the White generals, saved Moscow in 1919 from an attack by the general Denikin and in November 1920 helped the Bolshevik to defeat general Wrangel. The Bolshevik looked upon the anarchist Makhno movement as an enemy first of all because Makhno fought to establish a more democratic Ukraine. However, 26 November 1920 the Bolshevik government invited headquarters staff and many of Makhno's subordinate commanders to a Red Army planning conference in Moscow only to have them imprisoned and executed. At that time was there already a decision to eliminate the Makhno movement. Nestor Makno escaped the hunt by the Red Army and in August 1921 he and 77 of his followers managed to escape into Romania and further to Poland, Germany to reach France where Makno died in 25 July 1934. The provisional government with its second and third coalition was led by a right wing fraction of the Socialist-Revolutionary party, SR. This non-elected provisional government faced the revolutionary situation and the growing mood against the war by avoiding elections to the state Duma. However, the October revolution forced the political parties behind the newly dissolved provisional government to move and move fast for immediate elections. All happened so fast that the left SR fraction did not have time to reach out and be represented in ballots of the SR party which was part of the coalition in the provisional government. This non-elected government supported continuation of the war on the side of the allied forces. The elections to the State Duma 25 November 1917 therefore did not mirror the true political situation among peasants even if we don't know how the outcome would be if the anti-war left SR fraction had a fair chance to challenge the party leaders. In the elections the Bolshevik party received 25% of the votes and the Socialist-Revolutionaries as much as 58%. It it possible the left SR had a good chance to reach more than 25% of the votes and thereby legitimate the October revolution but we can only guess. Lenin did not believe as Karl Marx that a socialist revolution presupposed a developed capitalist economy and not in a semi-capitalist country as Russia. Russia was backward but not that backward with a working class population of more than some 4-5% of the population, rather some 4-5 times more if we take into account all the family members of the class. Lenin also dismissed Marx' concept that the liberation of the working class (population) was their own task. In his book 'What is to be Done?' from 1903 he claimed the working class (population) is a reformist and trade unionist class which only can succeed under the leadership of a centralized revolutionary party of radical intellectuals from the upper bourgeois classes and only to a lesser degree by intellectual workers who surprisingly should leave their jobs to be professional party officials. 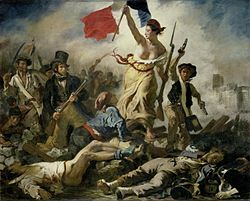 This was a break with Marxism and identical to a Jacobin ideology from the French Revolution which also defended an elitist concept of the few leading the many from the top. Though Lenin was the leader of the Bolshevik Party, it has been argued that since Lenin was not present during the actual takeover of the Winter Palace, it was really Trotsky's organization and direction that led the revolution, merely spurred by the motivation Lenin instigated within his party. Critics on the Right have long argued that the financial and logistical assistance of German intelligence via their key agent, Alexander Parvus was a key component as well, though historians are divided, since there is little evidence supporting that claim. The dissolution of the Constituent Assembly on 6 January 1918. The Tauride Palace is locked and guarded by Trotsky, Sverdlov, Zinoviev and Lashevich. Soviet membership was initially freely elected, but many members of the Socialist Revolutionary Party, anarchists, and other leftists created opposition to the Bolsheviks through the Soviets themselves. The elections to the Russian Constituent Assembly took place 25 November 1917. The Bolsheviks gained 25% of the vote. When it became clear that the Bolsheviks had little support outside of the industrialized areas of Saint Petersburg and Moscow, they simply barred non-Bolsheviks from membership in the Soviets. The Bolsheviks dissolved the Constituent Assembly in January 1918. Not surprisingly, this caused mass domestic tension with many individuals who called for another series of political reform, revolting, and calling for "a third Russian revolution," a movement that received a significant amount of support. The most notable instances of this anti-Bolshevik mentality were expressed in the Tambov rebellion, 1919–1921, and the Kronstadt rebellion in March 1921. These movements, which made a wide range of demands and lacked effective coordination, were eventually defeated along with the White Army during the Civil War. The Russian Civil War, which broke out in 1918 shortly after the October Revolution, resulted in the deaths and suffering of millions of people regardless of their political orientation. The war was fought mainly between the Red Army ("Reds"), consisting of the uprising majority led by the Bolshevik minority, and the "Whites" – army officers and cossacks, the "bourgeoisie", and political groups ranging from the far Right, to the Socialist Revolutionaries who opposed the drastic restructuring championed by the Bolsheviks following the collapse of the Provisional Government, to the Soviets (under clear Bolshevik dominance). The Whites had backing from other countries such as Great Britain, France, the United States, and Japan, while the Reds possessed internal support, proving to be much more effective. Though the Allied nations, using external interference, provided substantial military aid to the loosely knit anti-Bolshevik forces, they were ultimately defeated. The Bolsheviks firstly assumed power in Petrograd, expanding their rule outwards. They eventually reached the Easterly Siberian Russian coast in Vladivostok, four years after the war began, an occupation that is believed to have ended all significant military campaigns in the nation. Less than one year later, the last area controlled by the White Army, the Ayano-Maysky District, directly to the north of the Krai containing Vladivostok, was given up when General Anatoly Pepelyayev capitulated in 1923. Several revolts were initiated against the Bolsheviks and their army near the end of the war, notably the Kronstadt Rebellion. This was a naval mutiny engineered by Soviet Baltic sailors, former Red Army soldiers, and the people of Kronstadt. This armed uprising was fought against the antagonizing Bolshevik economic policies that farmers were subjected to, including seizures of grain crops by the Communists. This all amounted to large-scale discontent. When delegates representing the Kronstadt sailors arrived at Petrograd for negotiations, they raised 15 demands primarily pertaining to the Russian right to freedom. The Government firmly denounced the rebellions and labelled the requests as a reminder of the Social Revolutionaries, a political party that was popular among Soviets before Lenin, but refused to cooperate with the Bolshevik Army. The Government then responded with an armed suppression of these revolts and suffered ten thousand casualties before entering the city of Kronstadt. This ended the rebellions fairly quickly, causing many of the rebels to flee seeking political exile. During the Civil War, Nestor Makhno led a Ukrainian anarchist movement, the Black Army allied to the Bolsheviks thrice, one of the powers ending the alliance each time. However, a Bolshevik force under Mikhail Frunze destroyed the Makhnovist movement, when the Makhnovists refused to merge into the Red Army. In addition, the so-called "Green Army" (peasants defending their property against the opposing forces) played a secondary role in the war, mainly in the Ukraine. Revolutionary tribunals were present during both the Revolution and the Civil War, intended for the purpose of combatting forces of counter-revolution. At the Civil War's zenith, it is reported that upwards of 200,000 cases were investigated by approximately 200 tribunals. These tribunals established themselves more so from the Cheka as a more moderate force that acted under the banner of revolutionary justice, rather than a utilizer of strict brute force as the former did. However, these tribunals did come with their own set of inefficiencies, such as responding to cases in a matter of months and not having a concrete definition of "counter-revolution" that was determined on a case-by-case basis. The "Decree on Revolutionary Tribunals" used by the People's Commissar of Justice, states in article 2 that “In fixing the penalty, the Revolutionary Tribunal shall be guided by the circumstances of the case and the dictates of the revolutionary conscience." Revolutionary tribunals ultimately demonstrated that a form of justice was still prevalent in Russian society where the Russian Provisional Government failed. This, in part, triggered the political transition of the October Revolution and the Civil War that followed in its aftermath. The Bolsheviks executed the tsar and his family on 16 July 1918. In early March, the Provisional Government placed Nicholas and his family under house arrest in the Alexander Palace at Tsarskoye Selo, 24 kilometres (15 mi) south of Petrograd. In August 1917 the Kerensky government evacuated the Romanovs to Tobolsk in the Urals, to protect them from the rising tide of revolution. However, Kerensky lost control after the Bolsheviks came to power in October 1917, and the conditions of their imprisonment grew stricter and talk of putting Nicholas on trial increased. As the counter revolutionary White movement gathered force, leading to full-scale civil war by the summer, the Romanovs were moved during April and May 1918 to Yekaterinburg, a militant Bolshevik stronghold. During the early morning of 16 July, Nicholas, Alexandra, their children, their physician, and several servants were taken into the basement and shot. According to Edvard Radzinsky and Dmitrii Volkogonov, the order came directly from Lenin and Sverdlov in Moscow. That the order came from the top has long been believed, although there is a lack of hard evidence. The execution may have been carried out on the initiative of local Bolshevik officials, or it may have been an option pre-approved in Moscow should White troops approach Yekaterinburg. Radzinsky noted that Lenin's bodyguard personally delivered the telegram ordering the execution and that he was ordered to destroy the evidence. Soviet painting Vladimir Lenin, by Isaac Brodsky. The Russian Revolution became the site for many instances of symbolism, both physical and non-physical. Communist symbolism is perhaps the most notable of this time period, such as the debut of the iconic hammer and sickle as a representation of the October Revolution in 1917, eventually becoming the official symbol of the USSR in 1924. Although the Bolsheviks did not have extensive political experience, their portrayal of the revolution itself as both a political and symbolic order resulted in Communism's portrayal as a messianic faith, formally known as communist messianism. Portrayals of notable revolutionary figures such as Lenin were done in iconographic methods, equating them similarly to religious figures, though religion itself was banned in the USSR and groups such as the Russian Orthodox Church were persecuted. The revolution ultimately led to the establishment of the future Soviet Union as an ideocracy; however, the establishment of such a state came as an ideological paradox, as Marx's ideals of how a socialist state ought to be created were based on the formation being natural and not artificially incited (i.e. by means of revolution). Leon Trotsky said that the goal of socialism in Russia would not be realized without the success of the world revolution. A revolutionary wave caused by the Russian Revolution lasted until 1923, but despite initial hopes for success in the German Revolution of 1918–19, the short-lived Hungarian Soviet Republic, and others like it, no other Marxist movement at the time succeeded in keeping power in its hands. This issue is subject to conflicting views on communist history by various Marxist groups and parties. Joseph Stalin later rejected this idea, stating that socialism was possible in one country. The confusion regarding Stalin's position on the issue stems from the fact that, after Lenin's death in 1924, he successfully used Lenin's argument – the argument that socialism's success needs the support of workers of other countries in order to happen – to defeat his competitors within the party by accusing them of betraying Lenin and, therefore, the ideals of the October Revolution. The Russian Revolution inspired other communist movements around the world in regions such as South Asia, Southeast Asia, and Latin America. The Chinese Communist Revolution began in 1946 and was part of the ongoing Chinese Civil War. Marx had envisioned European revolutions to be intertwined with Asian revolutions in the mid-19th century with his 1853 New York Tribune article, "Revolution in China and Europe," in which he references the Chinese as people in "revolutionary convulsion," brought about by British economic control. The May Fourth Movement is considered a turning point where Communism took root in Chinese society, especially among intellectuals. China was officially made a communist country on October 1, 1949, resulting in the establishment of the People's Republic of China (which still remains to this day) with Chairman Mao Zedong at its head. China's current leaders retain that Mao "developed the theory of revolutionary socialism" whilst reformer Deng Xiopeng "developed the theory of building socialism with Chinese characteristics." Cuba experienced its own communist revolution as well, known as the Cuban Revolution, which began in July 1953 under the leadership of revolutionary Fidel Castro. Castro's 26th of July Movement and Cuban Revolution followed in the footsteps of the Sergeant's Revolt in Cuba in 1933, similarly to how the 1905 Revolution in Russia preceded the October Revolution. Castro's movement sought "political democracy, political and economic nationalism, agrarian reform, industrialization, social security, and education." Similarly to the October Revolution, the Cuban Revolution removed a more traditional, hierarchical regime with the aim of establishing greater overall equality, specifically in the removal of former authoritarian president Fulgencio Batista. Cuba's revolution contributed to escalating tensions between the United States and USSR during Cold War, such as the CIA's failed Bay of Pigs Invasion by Cuban exiles in April 1961, and the Cuban Missile Crisis in October 1962. Today, Cuba is moving more towards Capitalism and a free-market economy, as the Center for Democracy in the Americas (CDA) believes Castro's policies during his rule fostered "an acceptance that market forces can play a role in economic policy and that economic growth must be the central criterion to judge economic success." The August Revolution took place on August 14, 1945, led by revolutionary leader Ho Chi Minh with the aid of his Viet Minh. During the Second World War, the French and Japanese fascists in Indochina (now known as Southeast Asia) began to experience significant resistance to their colonial rule. Due to the fact that both France and Japan were engaged in World War II, the Vietnamese people realized an opportunity to engage in an uprising, resulting in the bloody August Insurrection, ending colonial rule in Vietnam. Marxism was manifested in Vietnam as early as the Spring of 1925 when the Vietnamese Revolutionary Youth League was established, with the league being described as "first truly Marxist organization in Indochina" The domino effect caused more concern among Western countries in regards to Communism in Southeast Asia. One interpretation of the United States' involvement in the Vietnam War is "America had lost a guerrilla war in Asia, a loss of caused by failure to appreciate the nuances of counterinsurgency war." Since the Fall of Saigon on April 30, 1975, Vietnam has remained a communist country. Few events in historical research have been as conditioned by political influences as the October Revolution. The historiography of the Revolution generally divides into three camps: the Soviet-Marxist view, the Western-Totalitarian view, and the Revisionist view. Since the fall of Communism (and the USSR) in Russia in 1991, the Western-Totalitarian view has again become dominant and the Soviet-Marxist view has practically vanished. A Lenin biographer, Robert Service, states he "laid the foundations of dictatorship and lawlessness. Lenin had consolidated the principle of state penetration of the whole society, its economy and its culture. Lenin had practised terror and advocated revolutionary amoralism." Dates are correct for the Julian calendar, which was used in Russia until 1918. It was 12 days behind the Gregorian calendar during the 19th century and thirteen days behind it during the 20th century. 1874–81 Growing anti-government terrorist movement and government reaction. 1881 Alexander II assassinated by revolutionaries; succeeded by Alexander III. 1883 First Russian Marxist group formed. 1894 Start of reign of Nicholas II. 1898 First Congress of Russian Social Democratic Labour Party (RSDLP). 1900 Foundation of Socialist Revolutionary Party (SR). 1903 Second Congress of Russian Social Democratic Labour Party. Beginning of split between Bolsheviks and Mensheviks. 1904–5 Russo-Japanese War; Russia loses war. 1905 January Bloody Sunday in Saint Petersburg. 1905 June Battleship Potemkin uprising at Odessa on the Black Sea (see movie The Battleship Potemkin). 1905 October General strike, Saint Petersburg Soviet formed; October Manifesto: Imperial agreement on elections to the State Duma. 1906 First State Duma. Prime Minister: Petr Stolypin. Agrarian reforms begin. 1907 Third State Duma, until 1912. 1912 Fourth State Duma, until 1917. Bolshevik/Menshevik split final. 1914 Germany declares war on Russia. 1914 30 July The All Russian Zemstvo Union for the Relief of Sick and Wounded Soldiers is created with Lvov as president. 1914 August–November Russia suffers heavy defeats and a large shortage of supplies, including food and munitions, but holds onto Austrian Galicia. 1914 3 August Germany declares war on Russia, causing a brief sense of patriotic union amongst the Russian nation and a downturn in striking. 1914 18 August St. Petersburg is renamed Petrograd as 'Germanic' names are changed to sound more Russian, and hence more patriotic. 1914 5 November Bolshevik members of the Duma are arrested; they are later tried and exiled to Siberia. 1915 Serious defeats, Nicholas II declares himself Commander in Chief. 1915 19 February Great Britain and France promise Russia Istanbul and other Turkish lands. 1915 5 June Strikers shot at in Kostromá; casualties. 1915 9 July The Great Retreat begins, as Russian forces pull back out of Galicia and Russian Poland into Russia proper. 1915 9 August The Duma's bourgeois parties form the 'Progressive bloc' to push for better government and reform; includes the Kadets, Octobrist groups and Nationalists. 1915 10 August Strikers shot at in Ivánovo-Voznesénsk; casualties. 1915 17–19 August Strikers in Petrograd protest at the deaths in Ivánovo-Voznesénsk. 1915 23 August Reacting to war failures and a hostile Duma, the Tsar takes over as Commander-in-Chief of the armed forces, prorogues the Duma and moves to military headquarters at Mogilev. Central government begins to seize up. 1916 Food and fuel shortages and high prices. Progressive Bloc formed. 1916 January–December Despite successes in the Brusilov offensive, the Russian war effort is still characterised by shortages, poor command, death and desertion. Away from the front, the conflict causes starvation, inflation and a torrent of refugees. Both soldiers and civilians blame the incompetence of the Tsar and his government. 1916 6 February Duma reconvened. 1916 29 February After a month of strikes at the Putílov Factory, the government conscripts the workers and takes charge of production. Protest strikes follow. 1916 20 June Duma prorogued. 1916 October Troops from 181st Regiment help striking Russkii Renault workers fight against the Police. 1916 1 November Miliukov gives his 'Is this stupidity or treason?' speech in reconvened Duma. 1916 29 December Rasputin is killed by Prince Yusupov. 1916 30 December The Tsar is warned that his army will not support him against a revolution. 1917 Strikes, mutinies, street demonstrations led to the fall of autocracy. January Strikes and unrest in Petrograd. 8 March 23 February International Women's Day: strikes and demonstrations in Petrograd, growing over the next few days. 11 March 26 February 50 demonstrators killed in Znamenskaya Square Tsar Nicholas II prorogues the State Duma and orders commander of Petrograd military district to suppress disorders with force. 12 March 27 February * Troops refuse to fire on demonstrators, deserters. Prisons, courts, and police bombs attacked and looted by angry crowds. Okhrana buildings set on fire. Garrison joins revolutionaries. Formation of Provisional Committee of the Duma by liberals from Constitutional Democratic Party (Kadets). 14 March 1 March Order No.1 of the Petrograd Soviet. 15 March 2 March Nicholas II abdicates. Provisional Government formed under Prime Minister Prince Lvov. 16 April 3 April Return of Vladimir Lenin to Russia. He publishes his April Theses. 3–4 May 20–21 April "April Days": mass demonstrations by workers, soldiers, and others in the streets of Petrograd and Moscow triggered by the publication of the Foreign Minister Pavel Miliukov's note to the allies, which was interpreted as affirming commitment to the war policies of the old government. First Provisional Government falls. 18 May 5 May First Coalition Government forms when socialists, representatives of the Soviet leadership, agree to enter the cabinet of the Provisional Government. Alexander Kerensky, the only socialist already in the government, made minister of war and navy. 16 June 3 June First All-Russian Congress of Workers' and Soldiers' Deputies opens in Petrograd. Closed on 24 June. Elects Central Executive Committee of Soviets (VTsIK), headed by Mensheviks and SRs. 23 June 10 June Planned Bolshevik demonstration in Petrograd banned by the Soviet. 29 June 16 June Kerensky orders offensive against Austro-Hungarian forces. Initial success only. 1 July 18 June Official Soviet demonstration in Petrograd for unity is unexpectedly dominated by Bolshevik slogans: "Down with the Ten Capitalist Ministers", "All Power to the Soviets". 15 July 2 July Russian offensive ends. Trotsky joins Bolsheviks. 16–17 July 3–4 July The "July Days"; mass armed demonstrations in Petrograd, encouraged by the Bolsheviks, demanding "All Power to the Soviets". 19 July 6 July German and Austro-Hungarian counter-attack. Russians retreat in panic, sacking the town of Tarnopol. Arrest of Bolshevik leaders ordered. 20 July 7 July Lvov resigns and asks Kerensky to become Prime Minister and form a new government. Established 25 July. 4 August 22 July Trotsky and Lunacharskii arrested. 8 September 26 August Second coalition government ends. 8–12 September 26–30 August "Kornilov mutiny". Begins when the commander-in-chief of the Russian army, General Lavr Kornilov, demands (or is believed by Kerensky to demand) that the government give him all civil and military authority and moves troops against Petrograd. 13 September 31 August Majority of deputies of the Petrograd Soviet approve a Bolshevik resolution for an all-socialist government excluding the bourgeoisie. 14 September 1 September Russia declared a republic. 17 September 4 September Trotsky and others freed. 18 September 5 September Bolshevik resolution on the government wins majority vote in Moscow Soviet. 2 October 19 September Moscow Soviet elects executive committee and new presidium, with Bolshevik majorities, and the Bolshevik Viktor Nogin as chairman. 8 October 25 September Third coalition government formed. Bolshevik majority in Petrograd Soviet elects Bolshevik Presidium and Trotsky as chairman. 23 October 10 October Bolshevik Central Committee meeting approves armed uprising. 24 October 11 October Congress of Soviets of the Northern Region, until 13 October. 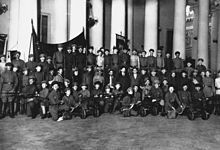 2 November 20 October First meeting of the Military Revolutionary Committee of the Petrograd Soviet. 7 November 25 October October Revolution is launched as MRC directs armed workers and soldiers to capture key buildings in Petrograd. Winter Palace reportedly attacked at 9:40pm and captured at 2am. Kerensky flees Petrograd. Opening of the 2nd All-Russian Congress of Soviets. 8 November 26 October Second Congress of Soviets: Mensheviks and right SR delegates walk out in protest against the previous day's events. Congress approves transfer of state authority into its own hands and local power into the hands of local Soviets of workers', soldiers', and peasants' deputies, abolishes capital punishment, issues Decree on Peace and Decree on Land, and approves the formation of an all-Bolshevik government, the Council of People's Commissars (Sovnarkom), with Lenin as chairman. George Orwell's classic novella Animal Farm is an allegory of the Russian Revolution and its aftermath. It describes the dictator Stalin as a big Berkshire boar named, "Napoleon." Trotsky is represented by a pig called Snowball who is a brilliant talker and makes magnificent speeches. However, Napoleon overthrows Snowball as Stalin overthrew Trotsky and Napoleon takes over the farm the animals live on. Napoleon becomes a tyrant and uses force and propaganda to oppress the animals, while culturally teaching them that they are free. The White Guard, Mikhail Bulgakov, 1926. Partially autobiographical novel, portraying the life of one family torn apart by uncertainty of the Civil War times. Also, Dni Turbinykh (IMDB profile), 1976 – film based on the novel. Konets Sankt-Peterburga AKA The End of Saint Petersburg (IMDB profile). 1927. Directed by Vsevolod Pudovkin and Mikhail Doller, USSR. October: Ten Days That Shook the World (IMDB profile). 1927. Directed by Sergei Eisenstein and Grigori Aleksandrov. Soviet Union. Black and White. Silent. Arsenal (IMDB profile). 1929. Set in the Ukraine. Written and directed by Aleksandr Dovzhenko. Scarlet Dawn, a 1932 Pre-Code American romantic drama starring Douglas Fairbanks, Jr. and Nancy Carroll caught up in the fallout of the Russian Revolution. Knight Without Armour. 1937. A British historical drama starring Marlene Dietrich and Robert Donat, with Dietrich as an imperiled aristocrat on the eve of the Russian Revolution. Lenin v 1918 godu AKA Lenin in 1918 (IMDB profile). 1939. Directed by Mikhail Romm, E. Aron, and I. Simkov. Historical-revolutionary film about Lenin's activities in the first years of Soviet power. Doctor Zhivago. 1965. A drama-romance-war film directed by David Lean, filmed in Europe with a largely European cast, loosely based on the famous novel of the same name by Boris Pasternak. Reds (IMDB profile). 1981. Directed by Warren Beatty, it is based on the book Ten Days that Shook the World. Anastasia (IMDB profile). 1997. An American animated feature, directed by Don Bluth and Gary Goldman. Assassin's Creed Chronicles, 2016. Of the several historical backdrops, players can take up the role of fictional assassin, Nikolai Orelov. His mission is to procure an artifact from the Tsar's house during the October Revolution's aftermath in 1918. Battlefield 1's In the Name of the Tsar Downloadable Content Pack (DLC), 2017. Players can choose to battle for objectives as either the Bolshevik Red Army or the Imperial White Army on two different locations: the Volga River and Tsaritsyn (now Volgograd). ^ Scholarly literature on peasants is now extensive. Major recent works that examine themes discussed above (and can serve as a guide to older scholarship) Christine Worobec, Peasant Russia: Family and Community in the Post Emancipation Period (Princeton, 1955); Frank and Steinberg, eds., Cultures in Flux (Princeton, 1994); Barbara Alpern Engel, Between the Fields and the City: Women, Work, and Family in Russia, 1861–1914 (Cambridge, 1994); Jeffrey Burds, Peasant Dreams and Market Politics (Pittsburgh, 1998); Stephen Frank, Crime, Cultural Conflict and Justice in Rural Russia, 1856–1914 (Berkeley, 1999). ^ Among the many scholarly works on Russian workers, see especially Reginald Zelnik [pl], Labor and Society in Tsarist Russia: The Factory Workers of St. Petersburg, 1855–1870 (Stanford, 1971); Victoria Bonnell, Roots of Rebellion: Workers' Politics and Organizations in St. Petersburg and Moscow, 1900–1914 (Berkeley, 1983). ^ a b See, especially, Dominic Lieven, Nicholas II: Emperor of all the Russias (London, 1993); Andrew Verner, The Crisis of the Russian Autocracy: Nicholas II and the 1905 Revolution (Princeton, 1990); Mark Steinberg and Vladimir Khrustalev, The Fall of the Romanovs: Political Dreams and Personal Struggles in a Time of Revolution (New Haven, 1995); Richard Wortman, Scenarios of Power, vol. 2 (Princeton, 2000); Orlando Figes, A People's Tragedy: The Russian Revolution 1891–1924, Part One. ^ a b Perfect; Ryan; Sweeny (2016). Reinventing Russia. Collingwood: History Teachers Association of Victoria. ISBN 9781875585052. ^ Figes, A People's Tragedy, 257–258. ^ Wildman: The End of the Russian Imperial Army (I), pp. 85–89, 99–105, 106 (quotation). ^ "Doklad petrogradskogo okhrannogo otdeleniia osobomu otdelu departamenta politsii" ["Report of the Petrograd Okhrana to the Special Department of the Department of the Police"], October 1916, Krasnyi arkhiv 17 (1926), 4–35 (quotation 4). ^ Service, 2005. p. 32. ^ When women set Russia ablaze, Fifth International 11 July 2007. ^ a b c d Beckett, 2007. p. 523. ^ Wade, 2005. pp. 40–43. ^ Browder and Kerensky, 1961. p. 116. ^ Malone, 2004. p. 91. ^ Service, 2005. p. 34. ^ N. N. Sukhanov, The Russian Revolution: A Personal Record, ed. and trans. Joel Carmichael (Oxford, 1955; originally published in Russian in 1922), 101–108. ^ Smele, Jonathan (2017). The "Russian" Civil Wars, 1916–1926. Oxford: Oxford University Press. p. 27. ^ Lenin, Vladimir (27 September 1964) . Apresyan, Stephen, ed. One of the Fundamental Questions of the Revolution (in Russian). 25. Jim Riordan (4th ed.). Moscow: Progress Publishers. pp. 370–77. ^ Stephen Cohen, Bukharin and the Bolshevik Revolution: A Political Biography 1888–1938 (Oxford University Press: London, 1980) p. 46. ^ a b Stephen Cohen, Bukharin and the Bolshevik Revolution: A Political Biography 1888–1938, p. 46. ^ V. I. Lenin, "State and Revolution" contained in the Collected Works of Lenin: Volume 25 (Progress Publishers: Moscow, 1974) pp. 3395–487. ^ V. I. Lenin, "The Bolsheviks Must Assume Power" contained in the Collected Works of Lenin: Volume 26 (Progress Publishers: Moscow, 1972) p. 21. ^ a b Caplan, Bryan. "Lenin and the First Communist Revolutions, IV". George Mason University. ^ a b Riasanovsky, Nichlas V.; Steinberg, Mark D. (2005). A History of Russia (7th ed.). Oxford University Press. ISBN 978-0195153941. ^ "The Kronstadt Mutiny notes on Orlando Figes, A People's Tragedy (1996)"
^ Petrograd on the Eve of Kronstadt rising 1921 Archived 15 July 2012 at Archive.today. Flag.blackened.net (10 March 1921). Retrieved on 2013-07-26. ^ Orlando Figes, A People's Tragedy: The Russian Revolution 1891–1924 (New York: Viking Press 1997), 767. ^ Kronstadtin kapina 1921 ja sen perilliset Suomessa (Kronstadt Rebellion 1921 and Its Descendants in Finland) by Erkki Wessmann. ^ a b Rendle, Matthew (2016-11-25). "Quantifying Counter-Revolution: Legal Statistics and Revolutionary Justice during Russia's Civil War, 1917–1922". Europe-Asia Studies. 68 (10): 1672–1692. doi:10.1080/09668136.2016.1255310. ISSN 0966-8136. ^ Justice, People's Commissar of. "Decree on Revolutionary Tribunals". www.marxists.org. Retrieved 2018-11-26. ^ Robert K. Massie (2012). The Romanovs: The Final Chapter. Random House. pp. 3–24. ISBN 9780307873866. ^ Dmitrii Volkogonov, Lenin: A New Biography (New York: Free Press, 1994). ^ Edvard Radzinsky, The Last Tsar: The Life And Death Of Nicholas II (New York: Knopf, 1993). ^ a b Wydra, Harald (September 2012). "The Power of Symbols—Communism and Beyond". International Journal of Politics, Culture, and Society. 25 (1–3): 49–69. doi:10.1007/s10767-011-9116-x. ISSN 0891-4486. ^ Qualls, Karl D., "The Russian Revolutions: The Impact and Limitations of Western Influence" (2003). Dickinson College Faculty Publications. Paper 8. (2): https://scholar.dickinson.edu/cgi/viewcontent.cgi?article=1037&context=faculty_publications Web. 14 Nov. 2018. ^ Marx, Karl. "Karl Marx in New York Daily Tribune". www.marxists.org. Retrieved 2018-11-26. ^ Zhongping Chen (2010-12-28). "The May Fourth Movement and Provincial Warlords: A Reexamination". Modern China. 37 (2): 135–169. doi:10.1177/0097700410391964. ISSN 0097-7004. ^ Kane, Thomas (January 2001). "China's Foundations: Guiding Principles of Chinese Foreign Policy". Comparative Strategy. 20 (1): 45–55. doi:10.1080/01495930150501106. ISSN 0149-5933. ^ a b Gil, Federico G. (1962). "ANTECEDENTS OF THE CUBAN REVOLUTION". The Centennial Review. 6 (3): 373–393. JSTOR 23737883. ^ Beach, Blue, Red Beach, and Green Beach. "Bay of Pigs Invasion." Northwoods and Garden Plot 32. 32, 42. ^ Lee, Brianna. "US-Cuba Relations." Council of Foreign Relations (2014). 6. ^ Chinh, Trường. The August Revolution. Foreign Languages Publishing House, 1958. 12–13. ^ Duiker, William J. (July 1972). "The Revolutionary Youth League: Cradle of Communism in Vietnam." The China Quarterly. 51. ^ Summers, Harry G. On strategy: A critical analysis of the Vietnam War. Presidio Press, 2009. xiii. ^ Acton, Critical Companion, 5–7. ^ Edward Acton, ed. Critical Companion to the Russian Revolution, 1914–1921 (Indiana University Press, 1997), pp. 3–17. ^ Robert Service, "Lenin" in Edward Acton; et al. (1997). Critical Companion to the Russian Revolution, 1914–1921. Indiana University Press. p. 159. ISBN 978-0253333339. ^ Robert W. Menchhofer (1990). Animal Farm. Lorenz Educational Press. pp. 1–8. ISBN 9780787780616. ^ "Assassin's Creed Chronicles". Ubisoft.com. Retrieved 2018-11-26. ^ "Battlefield 1 – In the Name of the Tsar – Battlefield Official Site". Battlefield. Retrieved 2018-11-26. Acton, Edward, Vladimir Cherniaev, and William G. Rosenberg, eds. A Critical Companion to the Russian Revolution, 1914–1921 (Bloomington, 1997). Beckett, Ian F.W. (2007). The Great War (2 ed.). Longman. ISBN 978-1-4058-1252-8. Brenton, Tony. Was Revolution Inevitable? : Turning Points of the Russian Revolution (Oxford UP, 2017). Cambridge History of Russia, vol. 2–3, Cambridge University Press. ISBN 0-521-81529-0 (vol. 2) ISBN 0-521-81144-9 (vol. 3). Figes, Orlando (1996). A People's Tragedy: The Russian Revolution: 1891-1924. Pimlico. ISBN 9780805091311. Daly, Jonathan and Leonid Trofimov, eds. "Russia in War and Revolution, 1914–1922: A Documentary History." (Indianapolis and Cambridge, MA: Hackett Publishing Company, 2009). ISBN 978-0-87220-987-9. Fitzpatrick, Sheila. The Russian Revolution. 199 pages. Oxford University Press; (2nd ed. 2001). ISBN 0-19-280204-6. Lincoln, W. Bruce. Passage Through Armageddon: The Russians in War and Revolution, 1914–1918. (New York, 1986). Malone, Richard (2004). Analysing the Russian Revolution. Cambridge University Press. p. 67. ISBN 978-0-521-54141-1. Marples, David R. Lenin's Revolution: Russia, 1917–1921 (Routledge, 2014). Mawdsley, Evan. Russian Civil War (2007). 400p. Piper, Jessica. Events That Changed the Course of History: The Story of the Russian Revolution 100 Years Later (Atlantic Publishing Company, 2017). Pipes, Richard (1997). Three "whys" of the Russian Revolution. Vintage Books. ISBN 978-0-679-77646-8. Rappaport, Helen. Caught in the Revolution: Petrograd, Russia, 1917–A World on the Edge (Macmillan, 2017). Service, Robert (2005). Stalin: A Biography. Cambridge: Belknap Press. ISBN 0-674-01697-1 online free to borrow. Service, Robert (2005). A history of modern Russia from Nicholas II to Vladimir Putin. Harvard University Press. ISBN 978-0-674-01801-3. Service, Robert (1993). The Russian Revolution, 1900–1927. Basingstoke: MacMillan. ISBN 978-0333560365. Smele, Jonathan. The 'Russian' Civil Wars, 1916–1926: Ten Years That Shook the World (Oxford UP, 2016). Tames, Richard (1972). Last of the Tsars. London: Pan Books Ltd. ISBN 978-0-330-02902-5. Wade, Rex A. (2005). The Russian Revolution, 1917. Cambridge University Press. ISBN 978-0-521-84155-9. Wood, Alan (1993). The origins of the Russian Revolution, 1861–1917. London: Routledge. ISBN 978-0415102322. Smith, S. A. "The historiography of the Russian revolution 100 years on." Kritika: Explorations in Russian and Eurasian History 16.4 (2015): 733–749. Smith, Steve. "Writing the History of the Russian Revolution after the Fall of Communism." Europe‐Asia Studies 46.4 (1994): 563–578. Wade, Rex A. "The Revolution at One Hundred: Issues and Trends in the English Language Historiography of the Russian Revolution of 1917." Journal of Modern Russian History and Historiography 9.1 (2016): 9–38. Warth, Robert D. "On the Historiography of the Russian Revolution." Slavic Review 26.2 (1967): 247–264. Reed, John. Ten Days that Shook the World. 1919, 1st Edition, published by BONI & Liveright, Inc. for International Publishers. Transcribed and marked by David Walters for John Reed Internet Archive. Penguin Books; 1st edition. 1 June 1980. ISBN 0-14-018293-4. Retrieved 14 May 2005. Serge, Victor. Year One of the Russian Revolution. L'An l de la revolution russe, 1930. Year One of the Russian Revolution, Holt, Rinehart, and Winston. Translation, editor's Introduction, and notes © 1972 by Peter Sedgwick. Reprinted on Victor Serge Internet Archive by permission. ISBN 0-86316-150-2. Retrieved 14 May 2005. Trotsky, Leon. The History of the Russian Revolution. Translated by Max Eastman, 1932. ISBN 0-913460-83-4. Ascher, Abraham, ed. The Mensheviks in the Russian Revolution (Ithaca, 1976). Browder, Robert Paul and Alexander F. Kerensky, eds., The Russian Provisional Government, 1917: Documents. 3 volumes (Stanford, 1961). Bunyan, James and H. H. Fisher, eds. The Bolshevik Revolution, 1917–1918: Documents and Materials (Stanford, 1961; first ed. 1934). Daly, Jonathan and Leonid Trofimov, eds. "Russia in War and Revolution, 1914-1922: A Documentary History." (Indianapolis and Cambridge, MA: Hackett Publishing Company, 2009). ISBN 978-0-87220-987-9. Read, Christopher: Revolutions (Russian Empire) , in: 1914-1918-online. International Encyclopedia of the First World War. Brudek, Paweł: Revolutions (East Central Europe) , in: 1914-1918-online. International Encyclopedia of the First World War. Sumpf, Alexandre: Russian Civil War , in: 1914-1918-online. International Encyclopedia of the First World War. Mawdsley, Evan: International Responses to the Russian Civil War (Russian Empire) , in: 1914-1918-online. International Encyclopedia of the First World War. Melancon, Michael S.: Social Conflict and Control, Protest and Repression (Russian Empire) , in: 1914-1918-online. International Encyclopedia of the First World War. Sanborn, Joshua A.: Russian Empire , in: 1914-1918-online. International Encyclopedia of the First World War. Gaida, Fedor Aleksandrovich: Governments, Parliaments and Parties (Russian Empire) , in: 1914-1918-online. International Encyclopedia of the First World War. Albert, Gleb: Labour Movements, Trade Unions and Strikes (Russian Empire) , in: 1914-1918-online. International Encyclopedia of the First World War. Gatrell, Peter: Organization of War Economies (Russian Empire) , in: 1914-1918-online. International Encyclopedia of the First World War. Marks, Steven G.: War Finance (Russian Empire) , in: 1914-1918-online. International Encyclopedia of the First World War. Violence and Revolution in 1917. Mike Haynes for Jacobin. 17 July 2017. This page was last edited on 14 April 2019, at 23:02 (UTC).